Fournier 2800 playing cards are quite popular in Spain and France. Made up by 100% plastic, Fournier 2800 comes in red and blue colors. The quality of marked Fournier cards here is perfect. 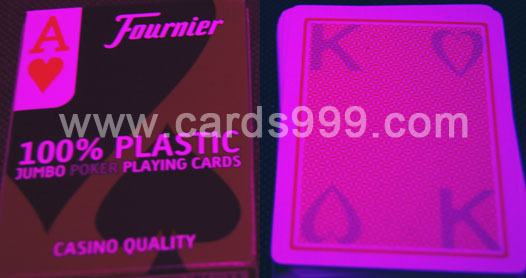 Fournier marked playing cards can use special invisible ink, when you work with infrared contact lenses and poker cheating glasses, you can see inivisible ink marked cards by yourself. It is easy for you to use and operate all by oneself. 2. Marked big font and suit in the middle back of the blue cards. We can also design the marks for your special order, customized mark as you like. Fournier marked poker cards also can work with poker scanner system and infrared camera. All kinds of marks are available. If you have poker winner predictor, we can make the cards as barcode cards, to be used by poker analyzer. If you have infrared camera, we can make the cards as infrared marked cards, to be used by your IR camera lenses.